After a quiet 2018 disease-wise and equipped with good varietal resistance, growers have a strong foundation on which to build cereal disease control programmes. Teresa Rush reports. The harvest 2018 season was relatively quiet in cereal disease terms with low to moderate yellow rust pressure, moderate to high but late brown rust pressure, and only occasional reports of mildew. 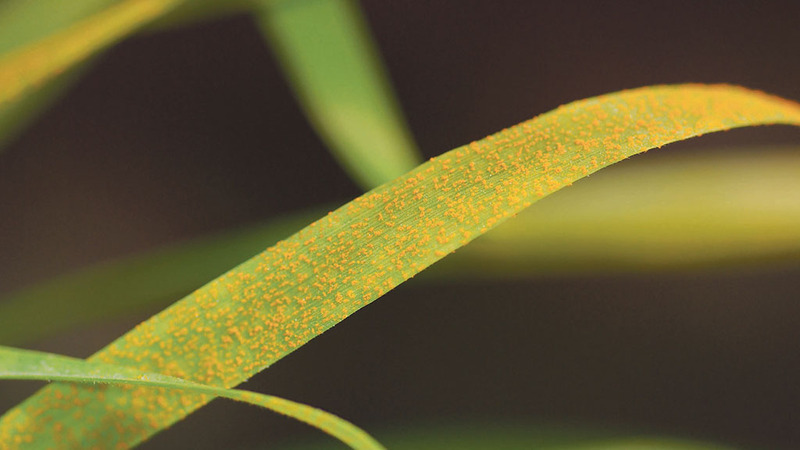 The UK Cereal Pathogen Virulence Survey (UKCPVS), which held its annual meeting in early March, received 132 samples of yellow rust during 2018, from 18 counties and 49 individual wheat varieties. Two yellow rust isolates not previously seen in UKCPVS monitoring were identified during the 2018 survey. Labelled Red 43 and Red 47, these may be associated with slightly higher than expected levels of disease say UKCPVS plant pathologists, but this has to be confirmed in adult plant trials this year. The most common yellow rust isolates found were Red 27 and Red 3, similar races to those found in 2017. With 23 winter wheat varieties on the 2019/2020 AHDB Recommended List having a yellow rust rating of 8 or 9, eight varieties rated 6 or 7 and just four, 5 or below, growers have a strong foundation on which to base their disease control programmes. Amelia Hubbard of UKCPVS says: “It puts us in a really good position moving forward in 2019. We have got a lot of varieties that are highly resistant. In early January, information on winter wheat seedling-stage resistance to yellow rust was updated by UKCPVS. Five varieties on the current RL were found to be resistant at the seedling stage during the latest tests. These are Costello, KWS Crispin, KWS Siskin, KWS Trinity and the newly recommended KWS Firefly. The first reports to UKCPVS of yellow rust this season were received in mid-January, from a plot of KWS Kinetic at NIAB in Cambridge and a crop of Dunston in north Cambridgeshire. More recently, in early March, UKCPVS received a report of high levels of yellow rust on a crop of Shabras in Essex. “But that is not unexpected as Shabras is seedling susceptible,” says Ms Hubbard. Trap crop nurseries were established working in partnership with plant breeders, samples were taken from the nurseries and isolates were collected and screened. Seedling and adult plant tests were subsequently conducted on RL varieties. In 2016 ‘Cougar’ isolates were found across the UK mainly on Cougar samples, but also to a limited extent on Amplify, KWS Santiago, KWS Siskin and Solace. In 2017 Cougar isolates were once again found across the UK, mainly on Cougar. “The take-home message is that this population of septoria is so mixed that there is obviously a whole heap of other virulence changes going on in the background which we have no understanding of,” says Dr Holdgate. JField pathogenomics – the genomics-based pathogen surveillance technique developed at the John Innes Centre in Norwich – has gone mobile. The field pathogenomics genotyping platform employs DNA sequencing technology to generate high-resolution data directly from infected field samples, which is then used to describe the diversity in a disease population. Until recently it has been a lengthy, lab-based process, taking up to three months to develop data. But now it has been taken into the field in Ethiopia via a portable platform called Mobile And Real-time PLant disEase – MARPLE. Using a handheld DNA sequencing device, the spread of individual strains of wheat yellow rust can be tracked in near real-time, with identification waits cut to hours. This means advisers and growers can make immediate decisions regarding disease management.